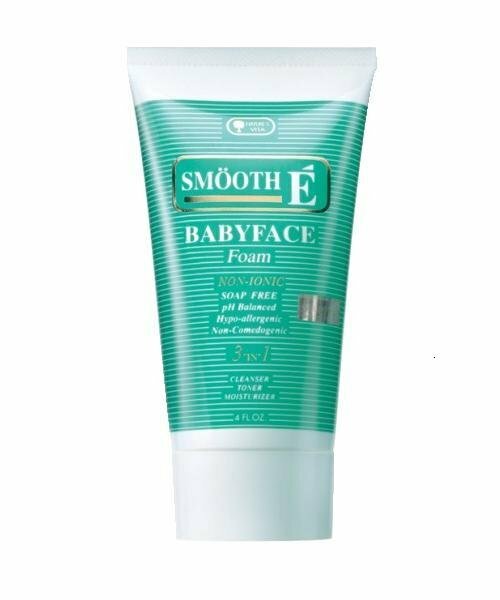 Net Weight : 1FL.OZ / 30 g.
Smooth E Babyface Foam is formulated to promote healthy skin. It contains selected mild cleansing agents and natural extracts of rose oil that effectively clean your skin and at the same time maintain its natural face moisture content.Because the selected mild cleansing agents are non-ionic and pH-neutral, they clean softly and thoroughly without any skin-irritating foam, You can immediately feel your face cleaner, softener, smoother and fresher.It is hypo-allergenic, thus suitable for all skin types, including delicate, sensitive, and dry skin. Ingredient: Natural Rose oil extract, Gentain extract, Camomile extract, Wheatgerm oil, and natural Vitamin E for toning and moisturizing. Natural Vitamin E fights perilous free radicals and aids skin smoothing and reduce wrinkles. The Non-Ionic Surfactant cleanses softly yet deeply. You'll feel and see the differences with Smooth E White Baby Foam.